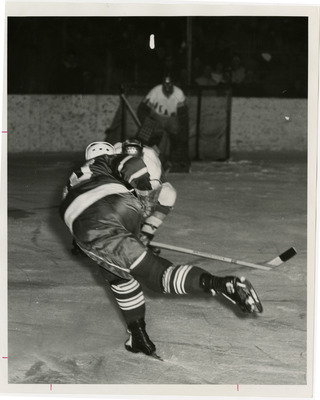 UND Hockey Player Dave Janaway moves the puck in a game versus the University of Alberta. Janaway played winger at UND from 1964 until 1967 and tallied 55 points during his career. This photograph can also be found in the 1965 Dacotah Annual, page 83.